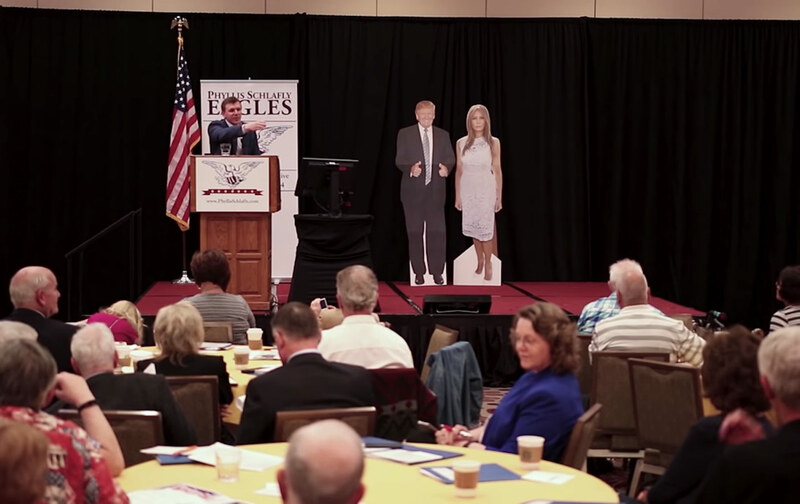 Last weekend, I attended the 47th iteration of the Phyllis Schlafly Gateway Eagle Council, a three-day conference in St. Louis for far-right politicians, media grifters, and their supporters. The panels, lectures, and presentations represented—unsurprisingly—the worst of the American political tradition, whether for its barely veiled racism and misogyny or its outright chauvinism. But even more unsettling than the euphemistic bigotry was the experience of stepping into a world so thoroughly shaped by “fake news” and “alternative facts.” If the conservative movement’s long con is finally blowing up, at Gateway Eagle Council XLVII we inhaled the radioactive fallout. Conspiratorial and paranoid thinking structured much of the weekend’s conversation. All those present—almost entirely white, mostly male, and, barring a small cohort of interns, extremely old—seemed to perceive themselves to be engaged in a Manichean, civilizational conflict of the individual versus the collective, good versus evil, Christianity versus Islam, or the West against… everyone else. None of this was meaningfully different from the Proud Boys’ position of “I am a Western chauvinist and I refuse to apologize for creating the modern world” or even Identity Evropa’s “You will not replace us.” In fact, it was very much in line with the long tradition of postwar ethnonationalism articulated by Europeans like Alain de Benoist and Renaud Camus or Americans like John Tanton and Jared Taylor, who have long sought to provide an intellectual veneer nativism and white nationalism. That isn’t to say that the Proud Boys (or their more extreme cousins) have any kind of influence over the Republican Party. But it does reveal something about how the party, institutions like the Eagle Council Education & Defense Fund, and the far-right street movement are coming into alignment. It’s old news that reactionary populism is taking hold all over the world, from Denmark to the Philippines. And conservative institutions such as the Eagle Council Education & Defense Fund—which was originally founded in 1981 with the goal of ending abortion rights and defeating feminism, and which organized the St. Louis event—are not exempt from its influence. 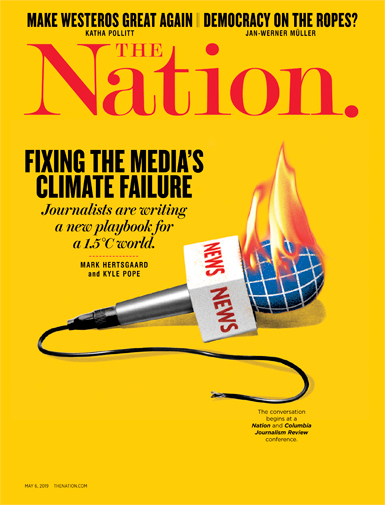 What’s becoming clear today is that institutional conservatives in the United States and abroad seem more than happy to reconcile themselves with activists and ideas that in another era might have been kept at the fringe: Tucker Carlson and Laura Ingraham are parroting white-nationalist talking points on Fox News (a direct line to the president); the winking anti-Semitic slur “globalist” is a part of everyday conservative vocabulary; General Flynn and his son, both proponents of the Pizzagate conspiracy theory, were honored guests in St. Louis. To the extent that the American conservative movement ever had a center—or at least a mechanism to keep certain elements on the fringe—it has collapsed; with Trump leading the Republican Party, right-wing extremism has moved openly into the mainstream, and the party’s base has welcomed it. In Making Sense of the Alt-Right, George Hawley, a political scientist at the University of Alabama, traces how contemporary white-nationalist movements like the “alt-right” both draw upon and react against tendencies within the American conservative movement like the paleoconservatism of Pat Buchanan and the John Birch Society and the radical libertarianism of the Koch network, united in their opposition to social programs and state-sponsored efforts to ameliorate racial or gender inequality. Paleoconservatives, Hawley writes, were “more comfortable talking about issues like immigration in explicitly ethnic terms” than their neoconservative rivals; thus, nativism had an intellectual home in the movement. The reactionary populism embodied by Trump, with the “alt-right” as its digital vanguard, recuperates this tradition and radicalizes it, as the Gateway Eagle Council shows—a forum where elected officials from right-wing parties around the world echoed “alt-right” talking points, even if they did not speak of the “alt-right” itself. As noted by Mic.com, far-right media operations like Breitbart News cover immigration in Europe obsessively, fixating on crimes allegedly committed by refugees. The site’s former chairman, Steve Bannon, is touring the continent, networking and supporting nativist parties in a half-dozen different countries. “The individual parties throughout Europe are ‘woke,’” he told Bloomberg. As it happens, before he was an MP, Bystron was kept under surveillance by the federal security services as a result of comments he made about the white-nationalist “identitarian” movement; his account of the relationship between identitarianism and the AfD would work equally well as a description of the relationship between “alt-right” and “alt-lite” groups in the United States and the Republican Party. Citing groups like the Identitarians and Pegida (an acronym for Patriotic Europeans Against the Islamisation of the Occident, a far-right anti-immigrant street movement in Germany), Bystron acknowledged that “there are many” such fronts. To that end, Bystron’s “pre-parliamentarian opposition” led thousands of Germans through the streets of Chemnitz last month, hunting down people they thought might be immigrants and reportedly attacking a Jewish restaurant. This squares with the Trump administration’s own moves. Just this week, CNN reported that dozens of undocumented immigrants who volunteered to take care of children in federal custody have been arrested, and Secretary of State Mike Pompeo announced that the United States would take in just 30,000 refugees in 2019—setting a record low cap for the second year in a row even as the administration works to dismantle the resettlement program itself. Fascistic movements do not simply accrue power and popularity on their own terms; they do so by drawing support from the mainstream. In postwar Europe, Fekete argues, “fascism was defined as a problem at the margins of society, a kind of gangrenous limb that needed to be cut off to preserve the health of the body politic.” Academics and politicians, regardless of their political views, came to believe that the extreme right pulled the discursive center of gravity rightwards—a natural process that had nothing to do with shared interests and beliefs between those on the extreme right and in the center. The St. Louis gathering was an example of these affinities in action. Cardboard cutouts of Donald and Melania Trump on the conference’s main stage leered over speakers’ shoulders as lies and paranoia hardened into something resembling a worldview. Repetition and the ritualistic remembering of moments from Trump’s presidential campaign and from his presidency reinforced the sense of community among these actors that has found a brief, defiant respite under siege. The Gateway Eagle Council, then, was not merely a convergence of the political periphery and the center. It was a celebration. An earlier version of this article did not distinguish between the Eagle Forum Education & Defense Fund, a 501(c)3, and Eagle Forum, a 501(c)4, both of which were founded by Phyllis Schlafly. The Gateway Eagle Council in St. Louis was organized by the Eagle Forum Education & Defense Fund.